When you can’t use steel in your ball mills because of contamination, what do you do? FOX Alumina Balls are the answer. The unique microstructures of FOX Alumina Balls result in hard, chemically inert grinding balls, that are corrosion resistant, non toxic, non magnetic, and non porous. This alumina grinding media possesses excellent thermal properties. So you can grind down to the particle size you need to achieve. 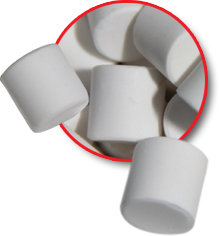 Better for some applications than porcelain, flint pebbles, or natural stones, FOX Alumina grinding balls are precisely engineered, down to the nanometer. Because when it comes to your ball milling process, every nanometer counts.